Phil Collins is one of a number of ex-Full Tilt Poker players who have been “forced” into live poker due to the demise of online poker in the States. Incredibly successful on the virtual felt, Phil had not achieved the same level of success in live tournaments until his qualification for WSOP Main Event final table in July. However, Phil´s appearance at the final table will be his ninth WSOP cash (although the first in a WSOP Main Event) and he has also enjoyed success on the North America Poker Tour, WPT and Atlantic City´s Borgata Open. 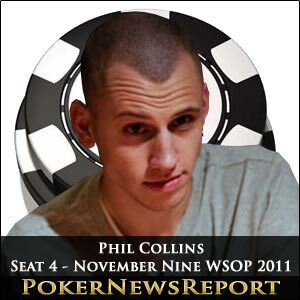 Most of Phil´s involvement in the tournament happened days before players were thinking of the final table. Phil was an elimination machine during days 4, 5 and 6 – and at dinner on Day 6 was the clear chip leader following the rapid eliminations of Giuseppe Pastura, Matt Waxman, Matt Wantman, Joseph Cheong and Lance Steinburg. Matt floated through Day 7 and, on Day 8, his only contributions of note were to crush Khoa Nguyen with a turned flush and to take an uncontested five million chip pot from Ben Lamb. What´s Phil Been Doing Since? Phil´s form deserted him big time on his European Tour. The graduate of the University of South Carolina (hence the USC in his online poker handle) acknowledged that he needed more live tournament experience prior to the final table of the WSOP Main Event, and following the Epic Poker League event in August, Phil entered the EPT Main Events in Barcelona, London and San Remo, the WPT Paris, Partouche Poker Tour and WSOPE – failing to cash in any of the Main Events or numerous side events he entered (although he claims to have taken a couple of thousand from co-November Niner Anton Makiievskyi in poker games in Cannes. Despite his good final table position (fourth in chips, position on Eoghan O´Dea and three shorter stacks behind) Phil is going to have difficulty getting into the final three. Phil did not really get involved in the tournament on the final day in July, and coasted into his final table appearance with the minimum of tight-aggressive pre-flop betting and one major pot. The goals are different on Sunday, and Phil will have no hiding place if he wants to take a passive role in the event – he needs to recapture the form of Day 6 to have any chance of progressing beyond the dinner break when the WSOP Main Event final table recommences. Continue reading the player profiles of other November Niners on our WSOP November Nine page here.